Ciudad Escuela is designed with a view to turning these various capacities into pedagogies. The website’s home has three icons: Discover (Descubre), Learn (Aprende) and Do (Haz). If you click on Discover you will be introduced to our 5 pedagogical itineraries: five approaches to thinking about open-source urbanism, from ‘Open Infrastructures’ to ‘Code and Languages’, ‘Interfaces’, ‘Urbanism in Beta’ and ‘Dis-placements’ (in Spanish, des-plazamientos, a playful word game on plazas-that-move). Each itinerary offers a route into imagining and re-assembling the city as an open-source experiment. Each itinerary is made up in turn by a variety of Badges. Some Badges form part of more than one itinerary (for example, ‘Open Designs’), while other Badges are exclusive to a particular itinerary. One can also navigate directly to the various Badges on offer by clicking directly on the ‘Learn’ button on the website’s home. Thus, to earn a Badge, we have teamed-up with community projects all over Madrid (and, incipiently, with initiatives at other Spanish cities) to have some of their activities included as skills that can earn Badges. There are auto-construction workshops by guerrilla architectural collectives, dérives and walkabouts led by neighbourhood associations, workshops on urban gardening, seminars on critical urban studies by academics, etc. 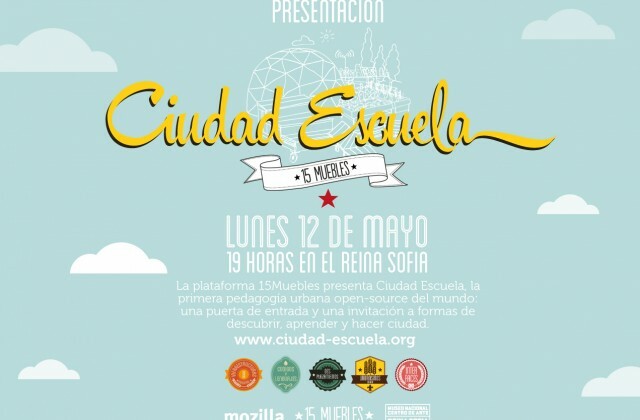 One of our itineraries speaks of the city as ‘Urbanism in beta’ and Ciudad Escuela is very much an experiment ‘in beta’ itself. Yet it is perhaps this capacity to mobilize relations, media surfaces and devices, and urban sites in novel contingent and productive arrangements that signals to a new field of political praxis in the city. Our School is as wide as the city itself, and it is our hope that this willingness to source its teaching materials, to open-source them from the city’s inexhaustible inventiveness, will warrant its proliferation and generativity. The city as school is now open — the city as school is open-source. ¡Genial! Ciertos criterios. Manten este liston es un post sincero. Tengo que leer màs articulos como este.